A few more interesting Apple Inc-filed patents have surfaced today (via Patently Apple) as part of the many applications published by the US Patent & Trademark Office recently. Perhaps the most notable include a design for an iPhone antenna clip, new finger reducing oil resistant coating, and a patent describing using solar energy as an alternate power source in portable devices (something we know Apple has been researching from patents and other sources in the past). 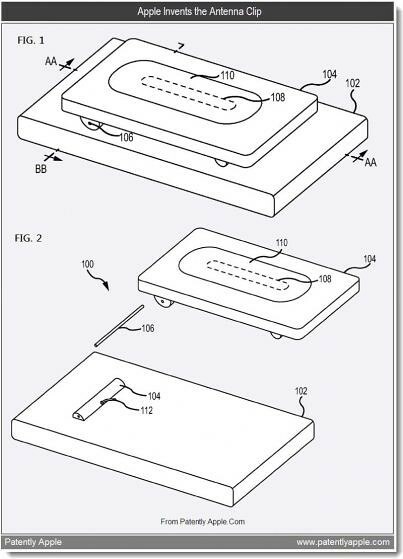 One of the more interesting patents with technology that could (and probably should) make its way to iOS devices in the near future is a the method of reducing “finger oils on touch surfaces”. The patent describes Apple’s method of “Direct Liquid Vaporization for Oleophobic Coatings”. Fingerprints have seem to become less of an issue to iPhone users over the years, but are definitely still a major annoyance to users in less than desirable lighting conditions. The image below shows what appears to be an antenna attached to a small device’s housing via an “attachment member”. Patently Apple reports Apple states the antenna invention could be used in “their iPod family (MP3 players), a radio, an audio/video recorder, a mobile telephone, personal digital assistant, tablet computing device, or other similar device”. They also speculate from the “exploded view above that it might even be an “iPhone-nano-like device”. Apple’s patent FIG. 1 illustrates a small form factor electrical device having an antenna located in an attachment member; FIG. 2 illustrates an exploded view of the attachment member of FIG. 1. The method includes milling a metal housing and a metal attachment member. A portion of the attachment member is relief cut and filled with an RF transparent material. An antenna is positioned in the relief cut portion of the attachment member.